In Philadelphia, soft pretzels are a significant and constant presence in life. Having grown up in that city, their delicious abundance forms the centerpiece of countless memories. Like of my neighbor who made deliveries at pretzel factories, where he would fill up his trunk with sheets of pretzels still warm from the oven. When the kids on my street saw his car pull into the driveway, we’d chant “Sam, Sam, the pretzel man” and run over for our delicious handout. Or pretzel Wednesdays in school where more sheets of pretzels still warm from the factory oven would appear in my classroom. A quarter bought a delicious snack, and when the pretzel was gone, I’d eat the salt off of my desk. Or when my mom was in school and was tasked with buying pretzels for her family, only to reach inside her desk during the day, picking away at each pretzel’s soft, white center. She’d arrive home to deliver hollow, golden pretzel shells. I’ve resorted to pathetic measures to get my pretzel fix during my 9+ years in DC, even getting them mailed and stashing them in my freezer. But everyone knows that soft pretzels are best on the day they’re made. I am now deep in the most pathetic measure of all- making them myself- but they are freaking fantastic, and if you don’t live in Philly, then I urge you to make them too. For a batch of 8, add 15 ounces (3 cups) of bread flour to the bowl of a stand mixer. Then add 1/2 tablespoon of brown sugar, 1 tablespoon of softened butter, and 1/2 tablespoon of active dry yeast. Stir those ingredients together, and then stir in 1.75 teaspoons (1/2 tablespoon plus 1/4 teaspoon) of kosher salt. If the salt makes direct contact with the yeast, it could kill it. Using the mixer’s paddle attachment, stir in 1 cup of warm water until the dough comes together and picks up all of the flour. Touch the dough: it should have a very slight tackiness to it. 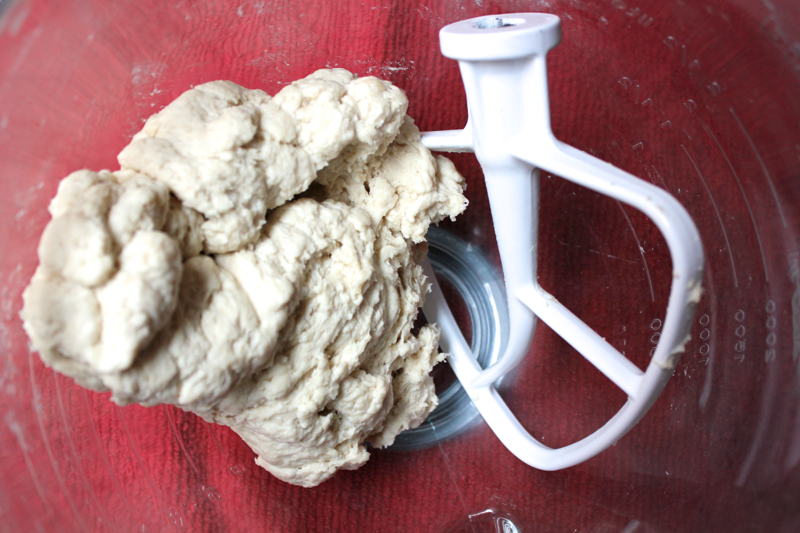 If the dough feels too dry, mix in 1 teaspoon of warm water, and test it again. Note: If you’re nervous about whether your yeast is good or not, you could add it into the warm water instead of mixing it into the flour. If the yeast disintegrates and begins to puff up, it’s good, and you can pour it and the water into the dough together. 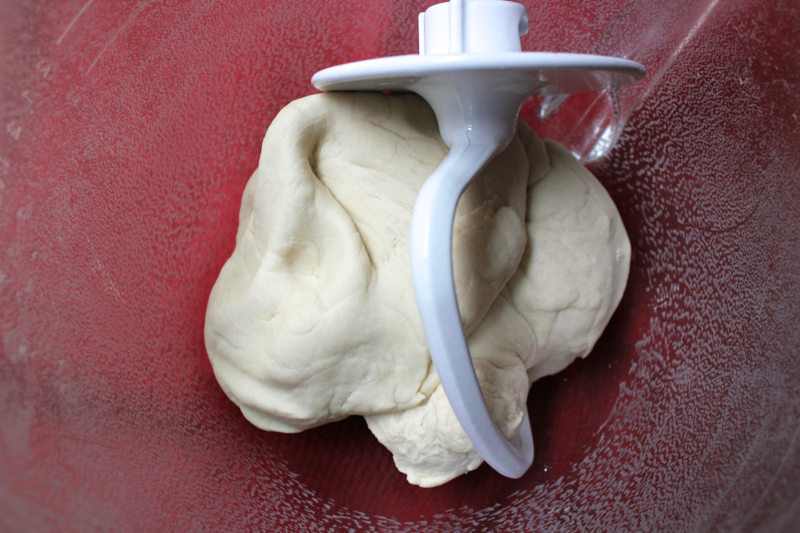 Swap the mixer’s paddle for the dough hook, and knead the dough on a high speed for 9 minutes. Seriously, set a timer– it’s very important to knead thoroughly to develop a proper amount of gluten in the pretzels or else they’ll just be pretzel-shaped breads. The bread flour helps with gluten development too because it contains more than all-purpose flour does. Remove the dough from the bowl, and divide it into 8 equal pieces. Each piece should weigh about 3 ounces. 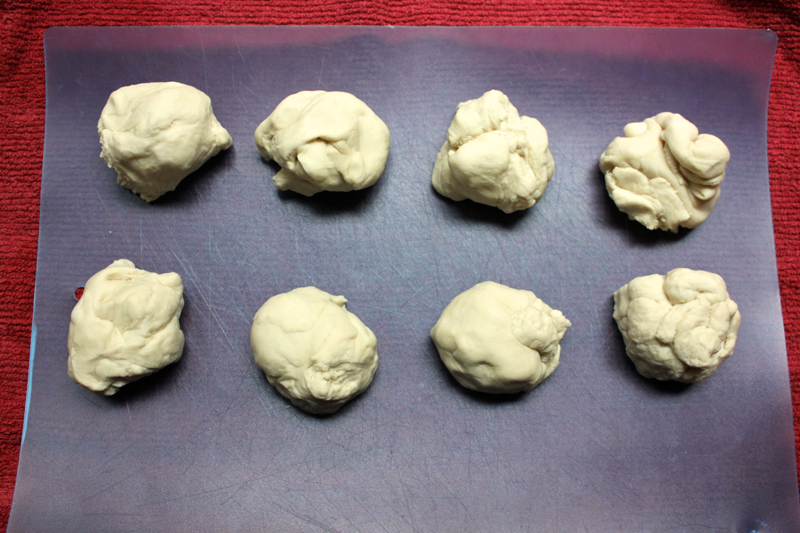 Set the dough balls on a parchment-lined baking sheet, and cover them loosely with plastic wrap. Let the dough rest for 30 minutes. This resting time is important because it will allow the gluten you developed in the dough to relax enough to shape the dough into pretzels. If you tried shaping the dough now, it would just snap back into its original shape. Let’s talk about pretzel shape. Philly soft pretzels are shaped like eights, not like the normal pretzels you’ll find just about everywhere else. I don’t know why they’re different, but I do know that the eight shape is more efficient; you can definitely fit more pretzels on a single pan. Once the 30 minute resting time is up, roll a piece of the dough into a long rope. Twist the two ends of the rope together- about 2 twists should do it. Then, fold the twisted ends over and stick them to the center of the rope. Gently stretch the pretzel’s two lobes into an eight shape, and place the pretzel back on the parchment paper, with the folded over piece on the bottom touching the pan so it doesn’t come undone. Repeat the folding process with the rest of the pretzels. Cover the formed pretzels with plastic wrap again, and allow them to rise for 1 hour. When that time is up, preheat your oven to 425° F.
Now it’s time to turn your pretzels into…pretzels. You’ll need food-grade lye. Yes, lye can be dangerous and corrosive (have you read Fight Club or the Silkworm? ), but it’s also easy to manage safely. You’ll definitely want to wear rubber gloves when working with it. I’ve also been rocking my ski goggles for eye protection, but that’s probably overkill because I haven’t had any splashes. Still, better safe than sorry. Plus, it’s a damn fine look. Now, make a lye solution for dipping the pretzels. Set a wide plastic container or bowl into your sink, and fill it with 2 cups of water. Measure out 1/8 cup of the lye, and slowly stir it into the water until it is dissolved. As the lye begins to dissolve, it will let out a single quick burst of fumes that aren’t pleasant to breathe in, so try not to breathe over the bowl during the mixing process. Once mixed, float one pretzel in the lye solution for 10 seconds, then flip it over, and let it float for another 10 seconds. Transfer the pretzel back to the parchment-lined baking sheet (lye corrodes aluminum), and repeat with the others. When you’re done with the lye solution, it’s safe to pour down the drain. Rinse off your gloves and carefully remove them. Sprinkle pretzel salt or coarse sea salt (used here) generously over the pretzels. 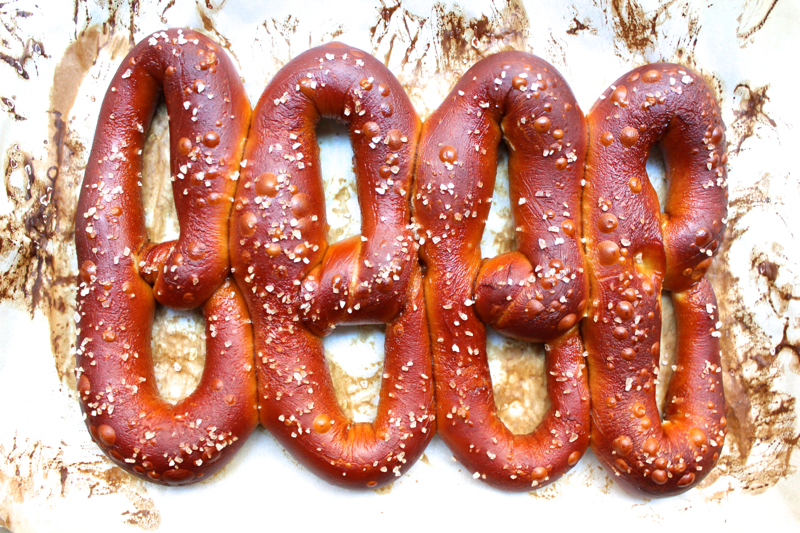 A note about pretzel spacing— Philly soft pretzels come in a sheet, and you pull the pretzels apart from each other. I tried that here, but the lye solution prevented the pretzels from sticking together. My guess is that the pretzel factories arrange the pretzels so they touch and then spray them with lye, but that’s not practical in my small container. So, I recommend spacing the pretzels apart on the baking sheet. Another note about the lye— if you’re totally freaked out by it, you could improvise using baking soda instead. But IT IS NOT AS GOOD. The pretzels won’t get those beautiful, crisp blisters and it just doesn’t taste the same. If you want to try it, however, bring a quart of water to a boil and add 1/4 cup of baking soda. Once dissolved, remove the pot of water from the heat. Allow each pretzel to float in the solution for about 1 minute on each side. You should still try to avoid getting the baking soda solution on your skin. Once treated, brush the pretzels with an egg wash before salting them. Transfer the sheet of pretzels into the oven to bake for approximately 13 minutes until they are golden brown and crisped on the outside. The smell is like heaven. Once cool enough to handle, serve the pretzels with mustard. SO GOOD!!! If you still have pretzels left at the end of the day, turn them into hard pretzels. Put them back on the baking sheet, and bake them at 325° F until they are crisp and darkly golden. Once completely cool, break the pretzels into pieces and store them in a closed container for an addictive and satisfying snack. Great photos and they look delicious!!! You answered your own question right there. It was actually the pretzel machinery builders in Reading, PA that came up with that figure 8 shape so they could utilize the maximum capacity of the ovens. They found that they could fit a row of 5 or 7 on the different size conveyor belts for the automatic ovens. You’re welcome Philly! I love when logic prevails. Thanks for the information!! I loved this recipe. I grew up in Philly and I missed these pretzels. They tasted just like them. Teied to dunk the pretzels into the lie they went a little mushie. The second batch I breed the lie on and it worked out just as well. All four pretzels right in a row. Thanks for this recipe I will use it often. Now all I need is a water ice recipe to go with it and I will be set. I am so glad you gave these a try! A water ice recipe would be welcome here as well, even though I now live much closer to a Rita’s! Wow. 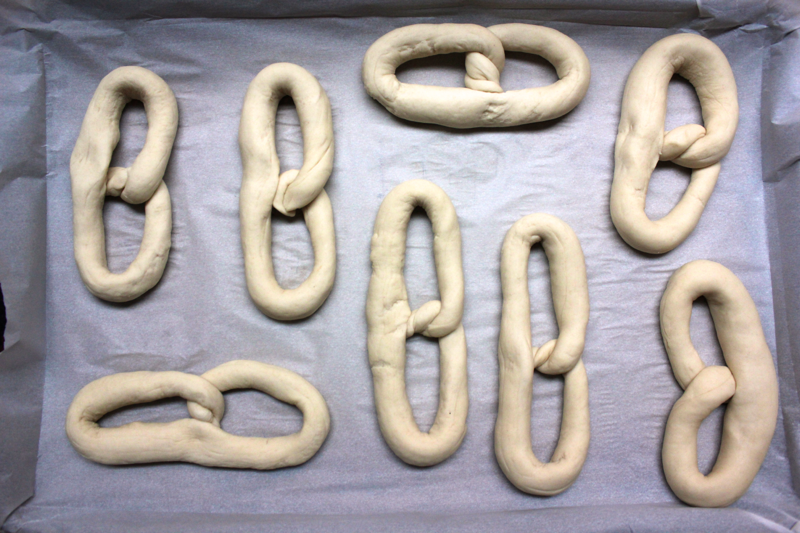 Made pretzels in Sapporo, Japan today and they were good but alas… I didn’t know how to get the right “Philly” shape. Thanks for the info! That is amazing! Thanks for writing in! Sorry the photos didn’t provide enough shaping guidance. I’ll think about how to make the instructions clearer. Have you ever made them ahead, refrigerate them and them bring them back to room temperature, dip in lye solution and bake? I grew up outside of Philly but now live in MS and was thinking about making them for kids in Bible school (150) or do you think that would be to labor intensive??? I haven’t let the pretzels rise in the fridge, but I think it would work just fine, and maybe even develop a better flavor. I would NEVER want to twist 150 of these pretzels though. It might be easier to roll the dough into ropes and cut them into nuggets. The baking time would probably be shorter for this approach. Good luck! If you were to open a business selling these Pretzels what would you charge per Pretzel? We lived in the Philly area in the late 1980’s and have yet to ever find a Pretzel like the ones made there. We truly miss them and are definitely going to try this recipe. Any input is appreciated. Also, what is up with selling them in brown paper bags? I remember that too. Thanks. I grew up eating soft pretzels in Philly but now live in Miami. This recipe worked out great, even working with the lye was no problem. One recommendation: instead of re-baking the leftovers into hard pretzels (which you can buy anywhere), put them in a Ziploc bag and freeze them before they go stale. If you carefully thaw them on low power in a microwave or low heat in a toaster oven, they are almost as good as new. Is the egg wash only used on the pretzels if you use the baking soda water? Or do you use it with the Lye as well? Only use the egg wash if you use baking soda water. It’s not needed with the lye. When making pretzels with baking soda, as as much into the boiling water as will dissolve, and dip the pretzels in while the water is boiling. This has two several effects. 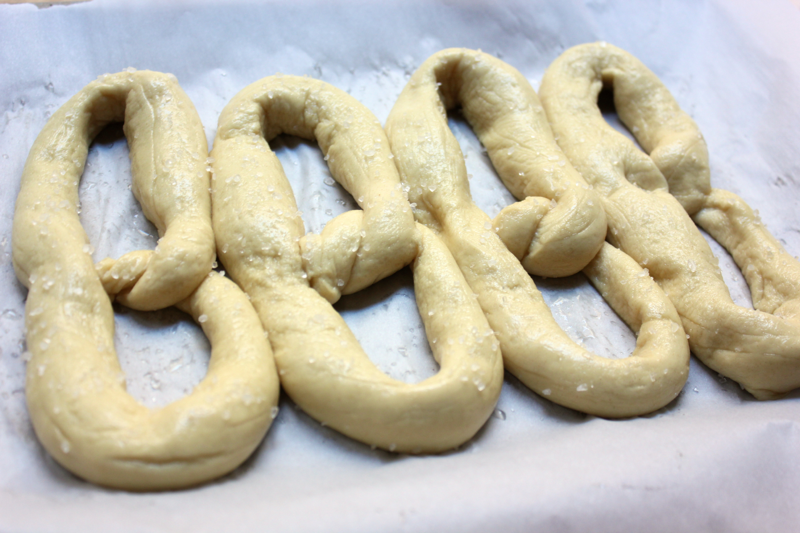 First, more baking soda means browner pretzels. 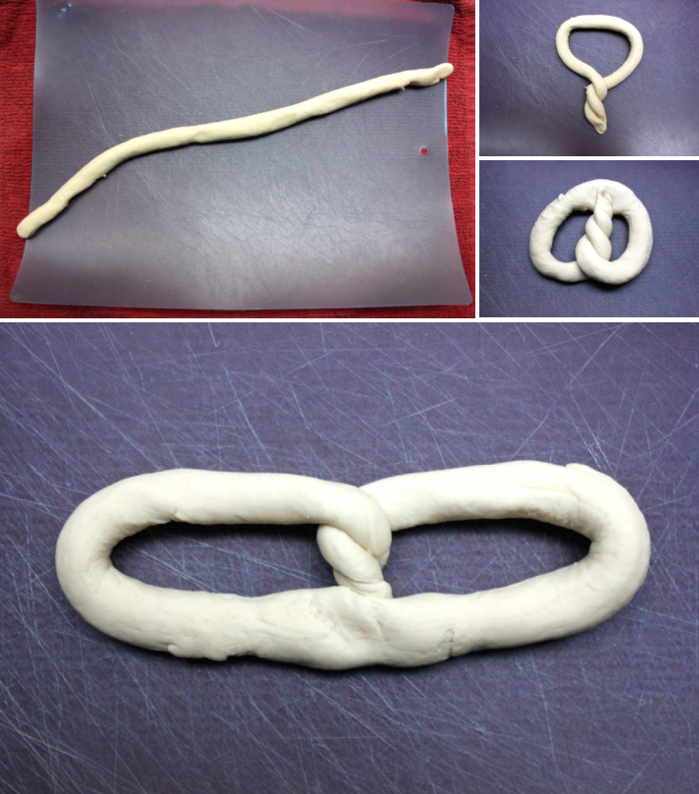 Second, using boiling instead of cold water produces a denser, chewier pretzel. Three, they’ll be slightly shinier, which means you might not need an egg wash. They still won’t taste exactly like lye pretzels, but they will better than cold-water baking soda pretzels. my 1st attempt at these went pretty well, but they stuck to the parchment paper after baking. the next time I put some non-stick spray down first…and they stuck again anyway! any tips to keep the pretzels from sticking during the baking process? Same! I sprayed the heck outta the paper the second time and they still stuck almost just as much. The first batch was perfect if it wasn’t for the paper stuck to it. Grease with butter? Oil? Don’t want to mess too much with the exterior. Inexperienced baker here. I haven’t had a sticking problem. Sure you’re using parchment paper and not wax paper? Can I add green food coloring to make them for the Super Bowl? This recipe was great. I did find the dough a little bland on the first try. Being from Philly ( live in VA) these pressils ( speaking Philly here) were legit! My Super Bowl party was a hit with these gems. 8 people from Philly and 2 from NY said they tasted like like home. Better then any street vendor. GO BIRDS!!! Super Bowl Champs! I appreciate your instructions on making pretzels. I am partial to King Arthur Flour, so I use a recipe of theirs…actually morphed theirs and yours…and the result is pure heaven. I too use food grade lye, with all the protection. 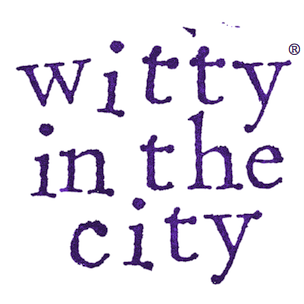 I have a question:I’ve seen recipes saying use room temp water mixed with lye…I know you boil the water/lye mixture…I tried that method and thought that the room temp water gave more flavor…can you give me thoughts on both methods? I haven’t tried room temperature before, but I’ll report back if I do. 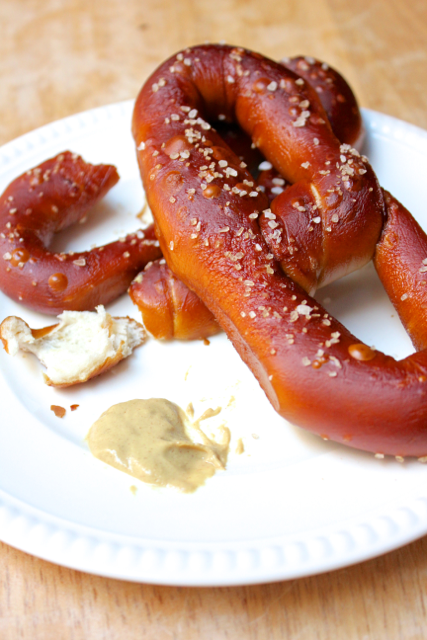 Would a shorter lye bath or a more diluted lye bath produce a less dark brown pretzel? Made them today for the first time and being an upstate NY transplant from Reading, I have to say they smaller and tasted great! Love this recipe! Easy and delicious. Dry the pretzel bottoms when they come out of the bath and dust the bottoms with flour and then they don’t stick as much. Also, I left mine unsalted and then brushed them with a little water or butter when they came out, then sprinkled salt. Wait 1 min, and the salt sticks when they dry. Also butter gave a lovely shine. Also, I tried both boiling and room temp bath. Boiling = hard crackly crust, like French bread. Room temp= chewy crust like bagel. The classic Philly pretzel I crave needs that room temperature kinda bath. Also I haven fallen in love with this soft stretchable dough. Turns put it makes good pizza dough and strudel dough, too. I spent most of my life in Philly but now spend most of my time in Florida. Whenever I visit there I bring back a suitcase full of fresh baked pretzels from the Philly Pretzel Factory. Honest to God, these are every bit as good! Actually they’re better cause I can eat them warm out of the oven. I baked mine for only 10 minutes which, for me, was perfect and, yes, I used lye. Thank you!